Chenequa Newsletter. Stay in touch. 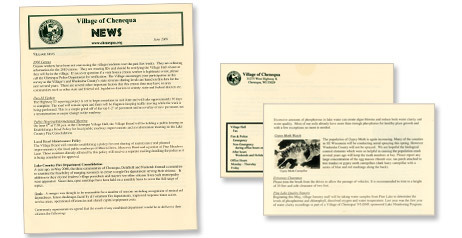 Employees at the Village of Chenequa publish a newsletter on an as-needed basis. When there is information that you need to know about the village, check out the newsletter and the website. You can sign up to receive these newsletters as a PDF via email under the Email Updates of the eServices portion of this website. Download a digital version of the most recent newsletter here. If you have missed or misplaced a newsletter, back issues are archived on this site under the News section.